Known as the non-barking dog, the Basenji never barks. 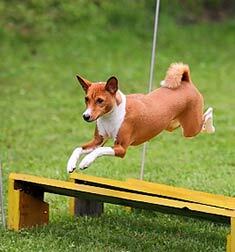 Elegant and athletic, the Basenji is roughly the size of a fox terrier. Its tail curls off to one side of its muscular thighs. The Basenji's forehead is furrowed with wrinkles. 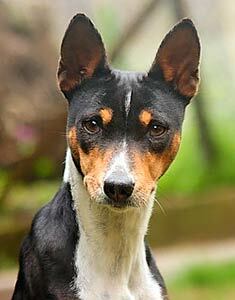 The Basenji originated in Egypt but was refined by English breeders. The Basenji comes in copper, red, black and tan, black and brindle. Usually with white feet and white on the chest and tip of the tail. May also have a white facial blaze, white legs and/or a white collar. This breed washes itself like a cat and has no doggie smell. It is a light shedder and good for people with allergies. The Basenji is prone to kidney problems, progressive retinal atrophy, intestinal, and eye problems. The Basenji is happiest living with two or three of its own and they will not fight amongst each other. Basenjis require plenty of exercise or else it will become fat and lazy. Find Basenji Puppies with our Free Breeder search!